Attractive Big Size High Bright RED LED Characters >>suitable for daylight use. Works with 12 volt DC supply ( ideal for use in Automobiles , Ships etc. and remote locations like in outdoor sports and such functions ). Table and wall mounting provision. High brightness LEDs are suitable for outdoor daylight applications also. ( Not for use against direct sunlight ). Recommended to be used under a shade protected from direct rain & sunlight . Size of clock is appx. 22 inches x 6 inches x 2.5 inches and weighs appx 2 Kgs. RS485 output for connecting any number of slave clocks in parallel up to a distance of 800 meters through any two core telephone cable. Attractive Big Size 1.5 inches High bright RED LED Characters . Indoor Use only. Once the time is updated by master clock it will continue to show correct time even if the master clock is switched off , however in case of power failure clock will be reset to 00:00:00 ,the clock will start to display accurate time as soon as the master clock is switched On. 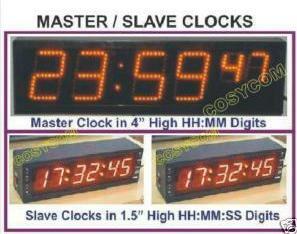 It is recommended to keep the master clock switched On all the time . Brightness LOW/Hi switch for dimming the clock at night . 12VDC socket provided for use in automobiles . Size of clock is appx. 10 inches x 3.5 inches x 2.5 inches and weighs appx 650 gms. ( cable not included in this offer , use any ordinary telephone wire etc. ). Price : Rs. 10,000 GST & shipping extra.